BNP Paribas, France’s biggest bank, pleaded guilty to criminal charges and agreed to pay a record-breaking penalty of nearly $8.9bn on Monday for dealing with countries that were the subject of US sanctions. Prosecutors said the bank had engaged in a “long-term, multi-jurisdictional conspiracy” involving currency trades for clients in Sudan, Iran and Cuba that was known at the highest levels at the company. 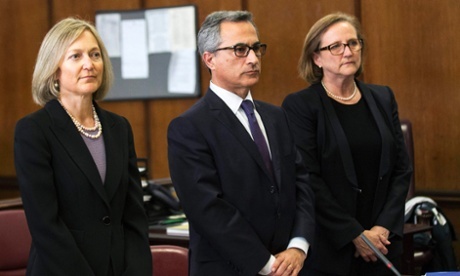 The Department of Justice and New York state prosecutors confirmed the agreement minutes after a lawyer for the bank appeared in a Manhattan courtroom to answer one count of falsifying business records, and one count of conspiracy. The bank will appear in a federal courtroom later in the week. At a press conference, the US attorney for the southern district of New York, Preet Bharara, aclled the bank’s actions a “tour de fraud”. The New York state banking regulator said it was banning BNP’s office in New York from conducting US dollar clearing operations for a year from 1 January 2015. The unprecedented sanction, imposed by the New York State Department of Financial Services, will largely affect BNP’s oil and gas finance business. The regulator also said 13 individuals will leave the bank as part of the settlement, including chief operating officer Georges Chodron de Courcel. His intention to leave after 42 years was announced in June without any mention of the discussions with US regulators. Other staff face demotions and bonus cuts. The fine is particularly bruising for BNP Paribas, which escaped the fallout from the 2008 financial crisis relatively unscathed and unlike many rival banks has not paid any fines or other penalties related to the crisis. But after months of discussion and and an intervention by French president François Hollande, the bank agreed to plead guilty to the offences. In 2007, BNP’s president told employees that the bank would stop doing business with Sudan, Iran and Cuba, according to a report in the Wall Street Journal. Yet regulators allege that BNP continued to deal with the blacklisted countries, and employees hid the transactions using satellite banks as fronts. The bank “placed its financial network at the service of rogue nations to improve its bottom line,” said assistant attorney general Leslie Caldwell on Monday. The nearly $9bn fine is a sizable one compared to BNP’s profits – the bank made $6.5bn in 2013. Caldwell said the fine reflected the transactions that prosecutors believed they could prove were criminal. The penalties are in line with a stronger approach taken more recently by the US attorney general Eric Holder, who said that no bank was “too big to jail,” although no BNP employees in this case are going to prison. FBI and Department of Justice officials said at Monday’s press conference that BNP’s penalty was harsher because the bank “hindered” their work. It was “an unprecedented penalty for unprecedented conduct”, Bharara said. The temporary ban on dollar clearing means that BNP’s clients must engage rival banks to send transactions through the financial system in the US. The sanction drew mixed reaction from analysts. RBC’s Anke Reigen warned it could send ripples through the banking industry. “In our view, a harsh decision on BNP will not come without consequences for financial markets and the banks that still have to go through the same investigation as BNP,” Reigen wrote, mentioning France’s Société Générale and Crédit Agricole, Germany’s Commerzbank and Italy’s UniCredit. The fine was the latest against a number of foreign-owned banks in the US but, unusually, the deal included a guilty plea. Swiss bank Credit Suisse was fined $2.6bn in May 2014 for helping US citizens evade tax, offences to which it also pleaded guilty. US banks have also faced a number of heavy penalties, including JP Morgan, which reached a record $13bn settlement with the US authorities in November over the sale of home loan bonds. But that sum included $9bn of compensation to settle federal and civil claims over the sale of the bonds. The BNP Paribas investigation, thought to have begun as long ago as 2007, involved a number of US regulators including the Justice Department and Benjamin Lawsky, the head of the New York department of financial services, which took action against Standard Chartered in 2012. The fine will be split between the agencies. At the height of the talks, Hollande wrote to Barack Obama to complain that the fine would be disproportionate, and in June, France’s foreign minister Laurent Fabius said the fine was not “reasonable”. There have been concerns that the scale of the fine could weaken the bank by lowering its all-important capital ratios, although Michel Barnier, the European commissioner for financial services, was quoted as saying that he bank “can handle” the fine. The bank appears to have underestimated the scale of the penalty after taking a provision of $1.1bn only a few months ago to cover the cost of the action by the US authorities, which has already knocked 15% off its share price. BNP head Jean-Laurent Bonnafe said: “we deeply regret the past misconduct that led to this settlement,” but he also stressed the French bank’s commitment to remaining in the US where it has a branch network on the West coast. BNP is setting up a new department in the US called Global Financial Security to ensure it complies with US rules, and will send all dollar transactions through its branch in New York. BNP Paribas SA agreed to pay nearly $9 billion Monday and plead guilty to crimes for violating U.S. sanctions, an unprecedented settlement that includes a year-long ban on the French bank’s ability to conduct certain U.S. dollar transactions. A Portugal Telecom (PT) esclareceu hoje que subscreveu, através de duas subsidiárias, um total de 897 milhões de euros em papel comercial da Rioforte, empresa do Grupo Espírito Santo, que vencem em meados de julho. A 26 de junho, o Expresso Diário noticiou que a PT detinha 900 milhões de euros de papel comercial da Rioforte e que a Comissão do Mercado de Valores Mobiliários (CMVM) estaria a preparar-se para analisar o caso, para averiguar se existia favorecimento acionista, uma vez que o Grupo Espírito Santo (GES) detém 10,05% da operadora de telecomunicações. Em comunicado enviado hoje à CMVM, assinado pelo presidente do Conselho de Administração e executivo, Henrique Granadeiro, e pelo administrador financeiro executivo, Luís Pacheco de Melo, a PT esclarece que “subscreveu, através das então subsidiárias PT International Financee BV e PT Portugal SGPS, um total de 897 milhões de euros em papel comercial da Rioforte com uma remuneração média anual de 3,6%”. A empresa adianta que “todas as aplicações de tesouraria em papel comercial da Rioforte atualmente em carteira têm vencimento em 15 e 17 de julho de 2012 (847 e 50 milhões de euros, respetivamente) “. A PT sublinha que as operações de tesouraria “são realizadas num contexto de análise de várias opções de investimento de curto prazo disponíveis no mercado, tendo como referência a atratividade da remuneração oferecida, e têm acompanhamento e são sufragadas pela Comissão Executiva”. A subscrição do papel comercial da Rioforte “tem presente a boa experiência de 14 anos em aplicações de tesouraria no Banco Espírito Santo (BES) e em entidades do GES, no contexto da parceria estratégica celebrada em abril de 2000 entre as partes”, adianta. A PT lembra que a parceria estratégica incluía a troca de participações entre as duas empresas, bem como a definição da PT enquanto fornecedora preferencial de telecomunicações do BES e a definição deste como fornecedor preferencial de serviços financeiros à operadora. “A esta data, o montante total de aplicações em papel comercial do GES ascende a 897 milhões de euros, relativo ao investimento em papel comercial da Rioforte”, acrescenta. A operadora aponta que desde 28 de abril deste ano que “não foram realizadas quaisquer aplicações e/ou renovações deste tipo de investimentos. O presidente do Banco Espírito Santo adquiriu mais de 1,5 milhões de ações do banco no âmbito da recente operação de aumento de capital, quando está prestes a deixar a liderança. Com a aquisição de 1.522.766 títulos, o líder histórico do Banco Espírito Santo (BES), passou a deter 5,3 milhões de ações do banco, de acordo com a informação hoje divulgada em comunicado através da Comissão do Mercado de Valores Mobiliários (CMVM). De resto, o presidente do BES contou com a companhia de mais oito administradores que participaram no aumento de capital do banco. José Manuel Espírito Santo Silva adquiriu mais de 400 mil papéis, passando a deter um total de 1,4 milhões de ações do BES, seguido por Amílcar Morais Pires, atual administrador financeiro e o nome apontado pelo principal acionista (Espírito Santo Financial Group) para substituir Salgado na presidência do banco, que comprou mais de 135 mil títulos para passar a contar com quase 470 mil ações. Ricardo Abecassis Espírito Santo Silva comprou quase 65 mil títulos (total de 224,6 mil ações), António Souto adquiriu mais de 42 mil papéis (total de 148,5 mil ações), Jorge Carvalho Martins comprou 13,6 mil títulos (total de 47,7 mil papéis), Joaquim Goes reforçou a sua carteira em 12,6 mil ações (total de 43,8 mil títulos), José Maria Ricciardi adquiriu 12 mil papéis (total de 42 mil ações) e Rui Manuel da Silveira adquiriu pouco mais de 2,5 mil ações (total próximo de 9 mil títulos). O BES concluiu recentemente um aumento de capital, de 1.045 milhões de euros, que foi totalmente subscrito com a procura a superar a oferta, tendo os resultados sido anunciados a 11 de junho. As novas ações começaram a ser negociadas a 17 de junho. O governador do Banco de Portugal, Carlos Costa, invocou o sigilo bancário para se escusar a prestar informações aos deputados da comissão parlamentar de Orçamento, Finanças e Administração Pública, sobre as mudanças em curso no Banco Espírito Santo (BES). O presidente desta comissão parlamentar, o socialista Eduardo Cabrita, esclareceu à Lusa que houve uma reunião de coordenadores em que foi decidido que seria pedida a vinda do governador do Banco de Portugal à comissão para ser ouvido a propósito do BES. O Banco de Portugal aceitou, há cerca de um mês, que o Banco Espírito Santo emprestasse 100 milhões de euros à RioForte, uma das holdings do Grupo Espírito Santo. A situação era de emergência segundo a edição do jornal electrónico Observador, em 27-06-2014. O financamento foi aceite em condições excepcionais e para resolver uma situação de grande urgência, isto é, de iminente default da RioForte por incapacidade de pagar uma parte do seu papel comercial que vencia nessa altura. Para além disso estava em curso o processo de aumento de capital do BES, um processo que as autoridades não queriam que fosse perturbado. A operação surge no quadro do refinanciamento da ESI, a holding onde uma auditoria detectou um elevado endividamento. Esta posição de princípio não terá impedido o Banco de Portugal de aprovar a operação. Recorde-se que, na cascata de participações do Grupo Espírito Santo, a RioForte é controlada pela Espírito Santo International (ESI), a holding de topo da família Espírito Santo que tem sede no Luxemburgo. A RioForte controla, por sua vez, a Espírito Santo Financial Group (ESFG). A operação surge no quadro do refinanciamento da ESI, a holding onde uma auditoria detectou um elevado endividamento, a existência de uma dívida não declarada de 1,3 mil milhões de euros, situação que levou à abertura de uma investigação pelas autoridades luxemburguesas. A ESI tem um “buraco” de 2,5 mil milhões, o que significa que tem capitais próprios negativos. Para esta situação tem contribuído a ausência de distribuição de dividendos por parte do BES. Uma parte importante da dívida da ESI esteve a ser financiada com base em papel comercial, um tipo de títulos de curto prazo que obriga a uma rotação muito rápida. Muitos desses títulos haviam sido colocados junto de clientes do BES, situação que levou o Banco de Portugal a impor a esse banco provisões no valor de 700 milhões de euros (essas provisões acabariam por ser assumidas pela ESFG. Não é possível separar deste quadro de grandes dificuldades, o empréstimo de 900 milhões de euros da Portugal Telecom à RioForte, ontem noticiado pelo Expresso diário. As dificuldades de financiamento da ESI tornaram-se críticas quando as irregularidades nas contas se tornaram públicas: os detentores de papel comercial, que regularmente renovavam os títulos de dívida no final dos prazos, começaram a exigir o reembolso. Uma parte do esforço de financiamento passou então para a RioForte, a holding do grupo que tradicionalmente agrupava as participações não financeiras, mas que recentemente passou a ter também a Espirito Santo Financial Group no seu portfolio. Foi precisamente a RioForte que necessitou, há cerca de um mês, do referido empréstimo do BES para evitar entrar em incumprimento. É neste quadro de grandes dificuldades para conseguir refinanciar as suas dívidas de curto prazo (sobretudo papel comercial) que se devem enquadrar as notícias dos últimos dias. Primeiro, o esforço de Ricardo Salgado para conseguir um aval do Governo a um empréstimo de 2,5 mil milhões de euros através de um sindicato bancário liderado pela Caixa Geral de Depósitos, esforço que estendeu às autoridades angolanas, não tendo conseguido a anuência dos governantes nem em Lisboa, nem em Luanda. Também não é possível separar deste enquadramento o empréstimo de 900 milhões de euros da Portugal Telecom à RioForte, ontem noticiado pelo Expresso diário. Como o BES é um accionista de referência da PT, com cerca de 10% do capital, a existência deste empréstimo desencadeou uma investigação da CMVM, o que está previsto na legislação que regula as chamadas transações entre “partes relacionadas” e que visa acautelar situações de conflito de interesses. No fundo, pretende-se saber se não houve, neste empréstimo, favorecimento de um acionista. Uma das grandes questões de actualidade Portuguesa é o caso BES, um escândalo de proporções desconhecidas, mas que não deixa de preocupar qualquer cidadão atento e preocupado com o seu País, uma vez que tem sido os Banqueiros e os Bancos os principais responsáveis pela situação de crise que conduziu Portugal para o abismo da pobreza e dos grandes sacrifícios impostos pelo governo aos trabalhadores e população em geral, cá e na Europa. Segundo o dossiê publicado em 27-06-2014 pelo Notícias de Almeirim, ” O caso BES é sintomático no que se refere aos devaneios que o capital financeiro tem feito e o prejuízo que tem causado aos cidadãos europeus e não só, e neste particular o BES tem tido um comportamento muito nebuloso, que deveria ser um caso de polícia em que os responsáveis deveriam ter de fazer contas mas com a justiça. Nos últimos anos o nome do Banco Espírito Santo tem vindo a emergir uma e outra vez, sempre pelas piores circunstâncias para uma entidade bancária. Em Janeiro de 2005, o juiz chileno Sergio Muñoz que instruía o processo dos assassínios de opositores políticos ordenados por Augusto Pinochet, deparou-se com indícios da existência de várias contas em nome do ditador sediadas em off- shores e outros bancos no estrangeiro, como o BES Miami. Na altura, um porta-voz do banco recusou-se a comentar a notícia, escudando-se atrás da confidencialidade devida a todos os seus clientes. A seguir às eleições legislativas de 2005, estala o escândalo Portucale, com alegadas ligações entre uma empresa financeira do Grupo BES, transferências clandestinas e ilegais de um milhão de euros para os cofres do CDS e dirigentes financeiros daquele partido. A Procuradoria acabou por decidir acusar formalmente, entre outros implicados, três altos quadros do Grupo BES. No Verão de 2005 rebenta o escândalo do “Mensalão”, esquema corrupto de compra de votos de deputados da oposição nas câmaras legislativas brasileiras por parte do PT e PTB. De novo o nome do BES vem à baila: as investigações envolvem a PT no Brasil e o BES, para cujas contas se teriam transferido 600 milhões de dólares norte-americanos. Desse saco sairiam as avenças periódicas pagas para comprar o apoio ao partido de Lula da Silva no poder. Um ano depois abate-se um “Furacão” sobre o BCP, o BPN, o Finibanco e… o BES, com buscas às sedes de Lisboa, Porto e Zona Franca da Madeira. Em causa está uma enorme fraude fiscal perpetrada com EMPRESAS fictícias e contas offshore por clientes daquelas entidades bancárias, suspeitas de assessoria técnica de apoio àquelas práticas. O processo é muito complexo dada a extensão das ramificações detectadas e a acusação formal ainda não foi deduzida. Em qualquer caso vários membros da família Espírito Santo viram as suas casas revistadas pela polícia. Idêntica operação dá-se em Espanha, acabando o BES por ser ilibado de culpa. Mesmo assim, em Dezembro de 2006, o juiz Baltasar Garzón pediu autorização para poder investigar contas sediadas no off-shore da Madeira. Existe também o caso da ESCOM/Submarinos, que na Alemanha levou à condenação de gestores responsáveis pelo NEGÓCIO por corrupção, sendo que em Portugal nada se sabe do desfecho deste caso. O Grupo Espírito Santo (GES) deu mais um passo ao serem conhecidas com detalhe as operações do BES Angola (BESA) que podem conduzir ao reconhecimento de uma perda equivalente a 80% do crédito concedido por aquele banco, isto é, 5,7 mil milhões de dólares, apesar de o Estado angolano ter entretanto emitido uma garantia de cinco mil milhões de dólares que permitirá, se executada, tapar grande parte do buraco financeiro, DINHEIRO que os responsáveis do banco dizem não saber para onde foi, esta resposta é vergonhosa, pois um valor destes não desaparece como se fosse vento. Não são conhecidos os termos da garantia assinada pelo Presidente angolano, José Eduardo dos Santos, mas sabe-se que tem um prazo de 18 meses (renovável) e que se for executada a consequência deverá ser a nacionalização do BESA pelo Estado de Angola e a diluição das participações dos restantes acionistas – BES (55,7%) Portmill (24%, general Kopelipa), Grupo Geni (18,99%, general Leopoldino do Nascimento) e Álvaro Sobrinho, ex-CEO do BESA, que ainda controla 1,3% do banco. O jornal i revelou que só onze dias antes de o presidente executivo (Ricardo Salgado) do BES se deslocar ao DCIAP, a 18 de Dezembro, para voluntariamente prestar depoimento no âmbito do processo ‘Monte Branco’, é que corrigiu a sua declaração de IRS de 2011. Na declaração, que entregou em Maio do ano passado, Ricardo Salgado declarou cerca de 1,1 milhões de euros, correspondentes a rendimentos seus e da sua esposa, tendo entregue 183 mil euros à colecta. Mas, este valor viria a ser corrigido, numa primeira rectificação, devido a 680 mil euros (25 mil de rendimentos da sua mulher e 655 mil de capitais do presidente do BES no estrangeiro) não declarados. Com factos destes, a conclusão a que chegamos é que a Família Espirito Santo utilizou também o DINHEIRO dos depositantes a seu belo prazer, comprou acções da PT, comprou campos de golfe, propriedades e hotéis, investiu no Brasil, em África e sabe-se lá mais aonde, comprou milhares de milhões de divida pública Portuguesa, comprou participações em Bancos em Espanha, fez o que quis sem prestar contas a ninguém. A Eurodeputada Ana Gomes disse que “O Grupo Espírito Santo está para o BES como a SLN estava para o BPN”, tendo já antes classificado do BES de o “GANG do BES”, mas na verdade é o que parece, uma autêntica família Vito Corleone em que o Padrinho é Ricardo Salgado. Acrescenta Ana Gomes que o BES recusou o financiamento da troika para “não ter de abrir as contas do banco à supervisão do Estado”. A eurodeputada socialista Ana Gomes comparou ainda o Banco Espírito Santo (BES) ao BPN, afirmando que ambos são ou foram instrumentos de actividade criminosa. Ana Gomes disse ainda, em declarações à Antena 1, que “ninguém, chame-se Salgado ou Espírito Santo, pode ser demasiado Santo para ir preso”. Para a Ana Gomes, o Estado está “na mão de governantes tão atreitos a recorrer ao GES/BES para contratos ruinosos. Das PPP ao sobreiros, dos swaps aos submarinos e outros contratos de defesa corruptos. À conta de tudo isso e de mecenato suficiente para capturar políticos, Ricardo Salgado conseguiu o cognome de DDT – o Dono de Tudo Isto. E conseguiu paralisar as tentativas de investigação judicial sobre os casos submarinos, Furacão, Monte Branco e até recorrer às amnistias fiscais oferecidas pelo governo”, concluiu. O i noticiou que o facto de a ESI estar a ser investigada no Luxemburgo não impede o Ministério Público de abrir um inquérito em Portugal para investigar a ocultação de parte do passivo desta holding de controlo do GES. O grande golpe de teatro surge agora com o Banco de Portugal a impor a mudança de administração, tentando ou querendo fazer supor que esta medida seria para acabar com a dinastia Espirito Santo, mas não é, pois para regente desta dinastia vai o seu braço direito, Amílcar Morais Pires, arguido num caso de abuso de informação na compra de acções da EDP. Também esta solução, que não é, permite que cada vez se torne mais claro a promiscuidade entre a política e o capital financeiro, pois p ara Chairman, o Grupo Espirito Santo propõe Paulo Mota Pinto, presidente do conselho de fiscalização das “secretas”, deputado do PSD e actualmente do conselho de administração da ZON. Ainda para a administração vai Rita Barosa, secretária de estado do Ministro Relvas… do PSD. Mas como tudo isto é para lançar areia nos olhos dos Portugueses, vai ser criado o Conselho Estratégico “que é destinado a assistir o Conselho de Administração na definição da estratégia societária, propondo a ESFG que para o mesmo sejam eleitos os Senhores Dr. Ricardo Espírito Santo Silva Salgado (Presidente), Dr. José Manuel Pinheiro Espírito Santo Silva, Dr. José Maria Espírito Santo Silva Ricciardi, Dr. Ricardo Abecassis Espírito Santo Silva e Dr. Pedro Mosqueira do Amaral, que se manterão nas actuais funções no BES até à data da Assembleia Geral”, apetece dizer, muda a fachada mas os alicerces são os mesmos. Só espero que falhadas as tentativas de Salgado entalar o Estado Português com a solicitação ao Primeiro-Ministro de levar a Caixa Geral de Depósitos a investir cerca de 2 mil milhões de euros no BES, o que Passos recusou, tendo-se Ricardo Salgado voltado para José Eduardo dos Santos, pensando eu que aí já não vai ser muito difícil, pois o dinheiro para este senhor é de borla. Esperando que não, peço a todos os santinhos que não tenhamos mais um caso BPN ou BPP à entrada da porta, é que mais um escândalo destes não há País que resista. A terminar esta novela só comparável á série “Dallas” que passou há alguns anos na RTP1, Ricardo Salgado termina com esta mensagem aos trabalhadores que começa dizendo “Decidi que era chegado o momento de passar o testemunho”, mal dito, pois o que ele devia ter dito era que vou sair porque o Banco de Portugal a isso me obriga, na mensagem também se vê a hipocrisia deste banqueiro quando se dirige aos trabalhadores, pois devia ter pedido desculpa por ter imposto que muitas mulheres que trabalham e trabalharam no BES não eram promovidas se optassem por casar ou ter filhos. Comunicado do Banco de Portugal sobre informação do Banco Espírito Santo, S.A. a propósito de proposta do acionista Espírito Santo Financial Group, S.A.
O Banco de Portugal tomou conhecimento da informação divulgada hoje pelo Banco Espírito Santo, S.A., referente ao pedido de convocatória de Assembleia Geral recebido da Espírito Santo Financial Group, destinado a alterar os estatutos de modo a criar um novo órgão estatutário, denominado Conselho Estratégico, para o qual transitam os senhores Dr. Ricardo Espírito Santo Silva Salgado, Dr. José Manuel Pinheiro Espírito Santo Silva, Dr. José Maria Espírito Santo Silva Ricciardi, Dr. Ricardo Abecassis Espírito Santo Silva e Dr. Pedro Mosqueira do Amaral, e consequente designação de novos elementos para o órgão de administração do Banco Espírito Santo, S.A..
Relativamente ao preenchimento dos órgãos de administração e de fiscalização, o Banco de Portugal aguarda a decisão da Assembleia Geral dos acionistas do Banco Espírito Santo, S.A., para avaliar o cumprimento por cada um dos indigitados dos requisitos necessários para o exercício de tais funções, definidos na legislação em vigor, designadamente os previstos nos artigos 30.º e 31.º do Regime Geral das Instituições de Crédito e Sociedades Financeiras. O Banco de Portugal também aguarda que lhe seja submetido, para avaliação, o modelo de governo interno que venha a ser aprovado em Assembleia Geral.